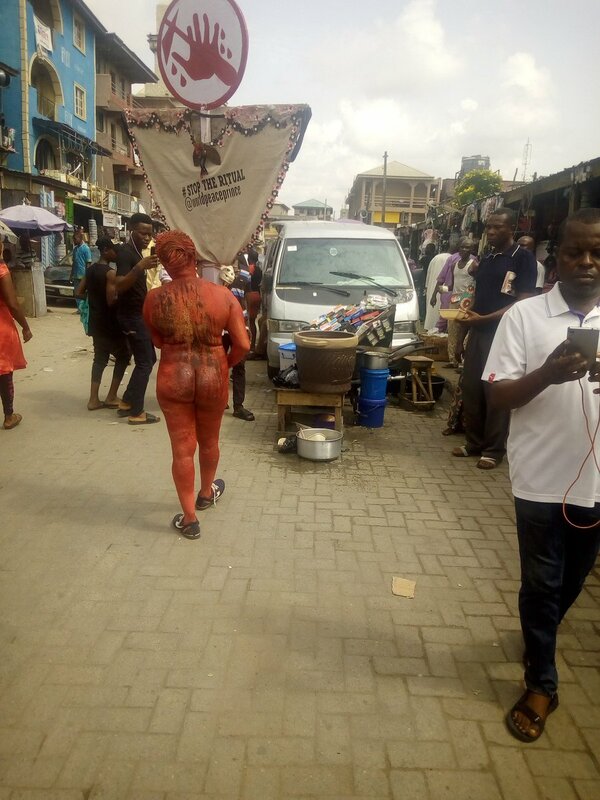 A woman was seen in Jankara today at around 11am in the morning walking around naked but covered in red painting from her head to toe while carrying a placard with her pleading with Nigerians to stop ritual killings. The placard simply read: 'Stop the ritual' in upper case. Many have suggested different reasons that might've triggered such an action, with many saying she was probably a victim of ritual killings, or maybe someone close to her was affected. Others simply tagged her a 'clout chaser', because although we cannot read the other things written on the placard, there seems to be an inscription that looks a lot like a social media handle. Her campaign is coming at a time when the country is filled so many ritual killing reports, people killing other people all for personal gain. We hope this campaign of hers touch if not all -which is very impossible- but atleast the hearts of some people who are involved in this dastardly act.